Tag for cats "Hear with cat"
Home/Tags engraved for pets/Tags engraved for cat/Figure tag for cats/Tag for cats "Hear with cat"
Если вы хотите адресник из мельхиора или серебра. Выберите опцию. Cat tag "Hear with cat" with the image on the front side and engraved addresses and phone on the other side it's good for the cats and dogs of small size. 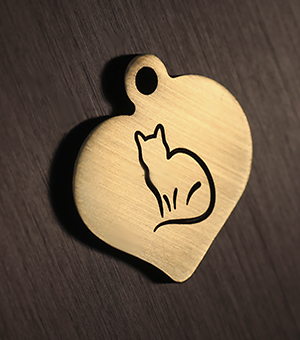 Different shape, silhouettes of cats, copyright image on the front side, will allow You not only to acquire utilitarian badge with engraving, but also to Express my love for your pet and to satisfy your aesthetic taste. Engraving included in the price tag for cats. Delivery in Russia and other countries.